BRAZIL: A massive fire on Sunday ripped through Rio de Janeiro’s treasured National Museum, one of Brazil’s oldest, in what the nation’s President said was a “tragic” loss of knowledge and heritage. The majestic edifice stood engulfed in flames as plumes of smoke shot into the night sky, while some 20 fire brigades battled to control the blaze that erupted. The fire “spread very quickly; there is a lot of inflammable material,” a spokesperson for Rio’s fire department told AFP, adding that there were no reports of victims so far. The natural history and anthropology museum was founded in 1818 by King Joao VI and is considered a jewel of Brazilian culture, housing more than 20 million valuable pieces. “This is a tragic day for Brazil,” President Michel Temer said in a statement. “Two hundred years of work and research and knowledge are lost.” “The loss of the collection of the National Museum is incalculable,” he said. The collection included art and artifacts from Greco-Roman times and Egypt, as well as the oldest human fossil found within today’s Brazilian borders, known as “Luzia.” The museum also housed the skeleton of a dinosaur found in the Minas Gerais region along with the largest meteorite discovered in Brazil, which was named “Bendego” and weighed 5.3 tons. Pieces covering a period of nearly four centuries -- from the arrival of the Portuguese to the territory in the 1500s until the declaration of the first Brazilian republic in 1889 -- had also been stored there. 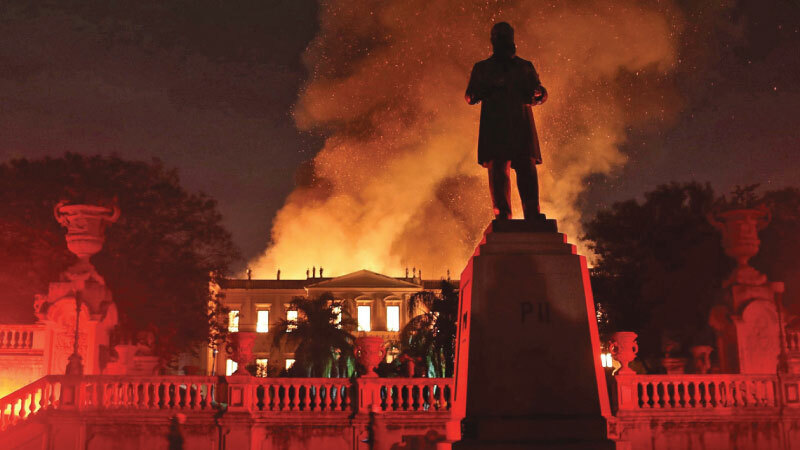 A deputy director at the museum, Luiz Fernando Dias Duarte, voiced “profound discouragement and immense anger” as the treasured institution burned, accusing Brazilian authorities of a “lack of attention.” He said the museum, a former palace that was once the official residence of the Portuguese royal family, had never had necessary support. “We fought years ago, in different governments, to obtain resources to adequately preserve everything that was destroyed today,” Dias Duerte told journalists. The National Museum, which is linked to the Federal University of Rio de Janeiro, has suffered from funding cuts. As flames raged researchers, professors and university students expressed a mix of sorrow and indignation, with some calling for demonstrations Monday in front of the ravaged building.